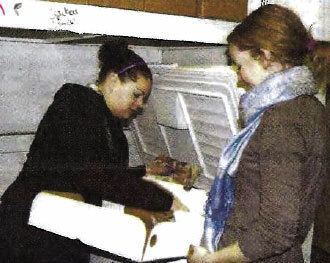 Northeast Kingdom Community Action employees Nicholle Bixby, left, and Brooke Brittell load frozen beef into a freezer at NEKCA on Monday. Fran Azur and Melanie Gefert of Newport Center, owners of the Vermont Highland Cattle Co., donated 3,000 pounds of beef to area food shelves. NEWPORT CITY — Food shelves in Orleans and Essex counties receive many donations, but consistently, the need is for protein. That's why the large donation of beef from Newport Center residents Fran Azur and Melanie Gefert and their Vermont Highland Cattle Co. is so welcome. A crew representing Azur and Gefert delivered 3,000 of beef worth $18,000 to five are food shelves on Monday. This is the fifth year that Azur and Gefert have donated meat, at first turkeys and then beef from their company after that, Mason said. Dinner at Cliff House was huge success! The Vermont Highland Cattle Co. dinner at the Cliff House at Stowe was a great success! Through a raffle and other generous donations, the Foodbank took home more than $700, which will provide more than 2,100 pounds of food to Vermonters in need. We thank all of our friends at the Vermont Highland Cattle Co. & Cliff House at Stowe, especially Brian Clark, for organizing this event. We look forward to teaming up with you both in the future! Vermont Highland Cattle Company hosted a Steakhouse dinner 3,625 feet up atop Mt. Mansfield in Stowe, Vermont at The Cliff House Restaurant. Guests arriving at the sold out dinner were greeted with hot cider and a blanket for the ride in the gondola to the restaurant at the top of the mountain. It was a beautiful evening as a light snow fell throughout the dinner. Chef Matthew Reeve incorporated local ingredients into the six course dinner which highlighted the beef from our farms. After the Steak Tartar Amuse and Tenderloin Carpaccio with Truffle Oil appetizer we were proud to host a fundraising raffle to benefit the Vermont Foodbank. The raffle raised $761. Emily Shipman from the Vermont Foodbank was present and she said it was a "great fundraiser". Every dollar raised can pay for 2 1/2 meals or 3 lbs of food. The raffle donations will provide more than 2,100 lbs of food to Vermonters. At the end of the evening guests boarded the gondola with a fleece blanket, full stomachs and fond memories of their Vermont Highland Cattle Company Cliff House dinner. Thank you General Manager Brian Clark for inviting us and we look forward to our next opportunity to host a dinner and help Vermonters in need. NEWPORT – The Vermont Highland Cattle Company hosted an expert on grass-fed beef from western Canada last week. Julius Ruechel of Vernon, British Columbia, has written a book on the subject called Grass-fed Cattle: How to Produce and Market Natural Beef. His company, called Woolly Rhino Enterprises, Ltd., offers consulting services to farmers interested in switching to raising grass-fed cattle. He told the owners of the cattle company, Fran and Melanie Azur, and Steve Mason and Trish Sears of Northeast Kingdom Tamarack, Incorporated, (NEKTI) Consulting, that there is growing demand for natural, grass-fed beef from cattle that graze all winter, even through the snow. He said the program could work in northern Vermont because it works in British Columbia and in the Yukon Territory. "I've had them grazing through three or four feet of snow," he said. He added that a program in Vermont could make a transition by extending the grazing season through November at first, and then maybe December the following year. As it gets colder, and snow falls, cattle will start pawing through the snow to reach the grass. The grass must be tall enough so that the tops of the plants are taller than the snow is deep. Otherwise, a crust of ice will keep the animals from getting to the grass. "The markets are so close, and yet you have absolutely natural conditions out here," said Mr. Ruechel. He said he believes the Azurs are in a perfect position because of their location and the size of the company — large enough to employ staff to build the fences needed for grass-fed cattle and to move them from paddock to paddock. "You've reached a critical mass as far as land and cattle," he said, "and you have a good crew." By comparison, out in the west in places like Montana and Wyoming, the cattle are a long way from the markets. The Vermont Highland Cattle Company has six farms. It has bought a meat processing plant in Orleans and is working on renovations and getting permits for it. In the wild, animals' metabolisms slow down in the fall so they don't need to eat as much. In an e-mail following up on the meeting, Mr. Ruechel said the public is waking up to the grass-fed revolution. "This is the future of the beef industry for both the conventional and the organic sector because it is such a cost-effective production system and it addresses all the health, environmental and ethical issues that surround the beef industry." He suggested to the Azurs that not only would there be a demand for the beef, but they could also develop genetics for grass-fed beef that are currently lacking. "You wind up with an animal that's most in tune with its environment," he said. "Winter is shaping up as a season of renewal in the Green Mountains of Vermont, as Norma's, the signature restaurant at Topnotch Resort and Spa, embraces a "new food attitude" based entirely on the finest local, organic provisions. Located in the village of Stowe, the patio-style restaurant recently revealed a new menu for the winter season by Executive Chef Mark Timms including a James Bond Martini appetizer ripe with molecular olives. "We strive for excellence at Norma's, both in what we serve and how we prepare it," said Chef Timms, an award-winning chef who joined Topnotch from the Lodge at Woodloch Spa in late 2008. We also affiliate ourselves with local organizations committed to these philosophies, such as the Vermont Fresh Network, VT Highland Cattle Company, Misty Knoll Farm and Pete's Greens, and seek to foster new relations with companies dedicated to it. NEWPORT CENTER — Vermont Highland Cattle owners Melanie and Francis Azur have recently bought their sixth farm, a refrigerated truck, and the former Comstock plant in Orleans where they will be able to butcher beef. The plan is to set that up sometime next year. At this point the company has 14 employees in Vermont and 500 head of cattle. "Our goal is to get up to 1,000 or 2,000," Ms. Azur said. The company was started in 2005, and in 2006, as Ms. Azur puts it, "we got serious." Vermont Highland Cattle is planning to get even more serious, and part of its plan is to be a good neighbor. The company is donating a ton of beef to local schools. Mr. Azur was born in Newport and met his wife, Melanie, in Pennsylvania. The two were working together in support services for real estate transactions. Eventually they started a company together, called ATM Corporation of America, which does appraisals, titles, and closing services. The two owned that company from 1993 until August of last year. Although they have spent a lot of their time in Pennsylvania, they are regularly in Vermont as well, and six years ago they built a house in Newport Center. They still have a place in Pennsylvania and divide their time between the two places. The Azurs have always had animals. In Pennsylvania they have 30 Paso Fino horses that they show, plus standardbred racehorses they raise and race, plus a couple of Icelandic horses they bought during a trip to Iceland. The general manager of the company is Josh Mason. Ray Edwards is in charge of sales, and he is finding that the local beef sells very well. Some of the chefs are very excited to hear about it. Although the Vermont Highland Cattle are not organic, they are not given grain with antibiotics in it or growth hormones. Some of the large cattle dealers out west regularly feed cattle antibiotics to increase their appetites in hot weather, Ms. Azur said. The only reason for using antibiotics on the Vermont Highland Cattle would be if an animal became sick. The majority of the animals don't ever get treated, according to herd master Derek Williams. The company just bought the former Bob Judd farm in order to have enough pasture acres for all their animals. Ms. Azur said they have about 500 acres of pasture, and each animal needs about an acre. They have 800 acres of crop land. Young animals are kept with their mothers for five or six months. "They learn how to graze and how to be a cow," she said. The animals are taken to local slaughterhouses — St. Johnsbury and Troy — so they don't have to travel great distances packed tightly into huge trailers. The Azurs are clearly quite proud of their cows. All of the bulls but one have won national championships in shows. They are all in the same paddock together and seem to get along just fine. They don't mind visitors coming into the paddock and seem to enjoy having their pictures taken and a nice scratch on the neck. "They love to be brushed and spoiled," Ms. Azur said. Another main interest of the Azurs is hunting, and their home is a showcase of huge impressive trophies — full body mounts of deer, bear, and a head and the front shoulders of a bison are seen in the main entrance. Mr. Azur has hunted all over the globe, including alligators in Lousiana and bears in Alaska. "It took us two times to Alaska to get the brown bear you wanted," Ms. Azur said to her husband. Ms. Azur fishes. She doesn't hunt but often accompanies her husband on his hunting trips. Another hobby of theirs is helping others who are less fortunate. "Fran and I are pretty active in philanthropic ideas," Ms. Azur said. The two started a foundation, the Bartko Foundation, using Ms.Azur's maiden name. Its mission is to help single minority women get education, transportation, and housing in Pittsburgh. Monthly beef donations to the local schools were scheduled to begin on Monday, September 29, with 60 pounds apiece to schools in Newport Center, Troy, Jay-Westfield, Lowell, and Coventry.